It’s that time of year when we draw inward and create cozy retreats for our families and ourselves. Embrace the cozy with a custom bath experience – right in your own home. We’ve got tips on how to create a spa-like set up you can retreat to again and again this winter. 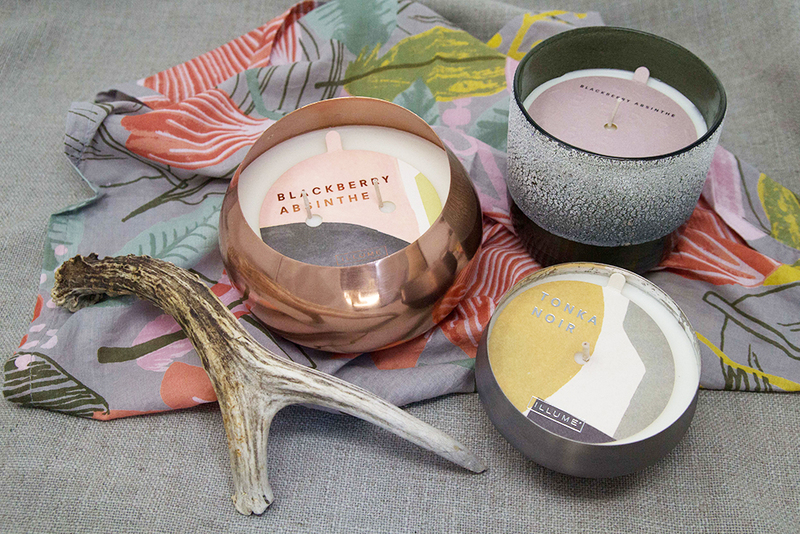 Up the style quotient of your bathroom counter with an Illume candle. These babies feature rich, natural scents, and have 65 hours of burn time, so you can have bath time every day! Get a spa feel in your own bathroom by powering up a Vitruvi diffuser that looks lux. These stone diffusers are beautiful and elegant. 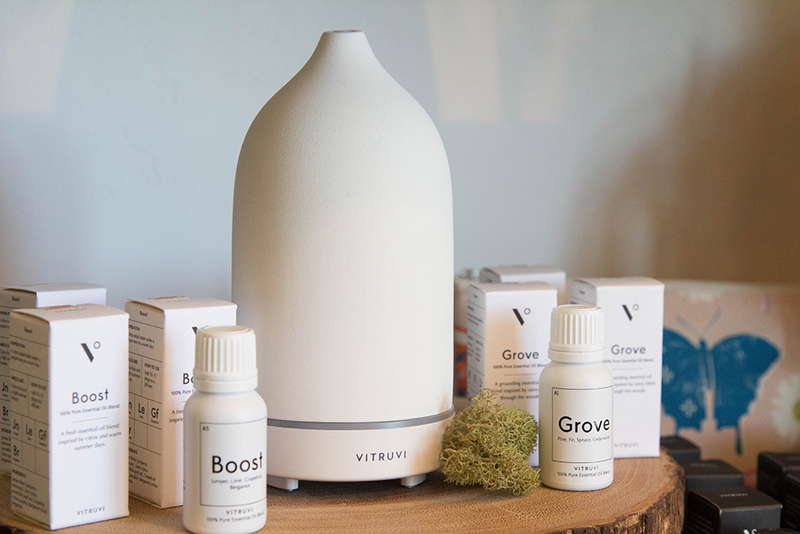 The 100% pure essential oils (try bergamot for grounding) you use in them from Vitruvi will make you feel calm and centered. Don’t forget the music! Put on your favorite relaxing playlist, or say “Alexa, play a spa music station” (this actually works). Wash with a naturally hydrating soap like SLAB. Find a soap or wash is moisturizing so you don’t feel dried out after a bath. 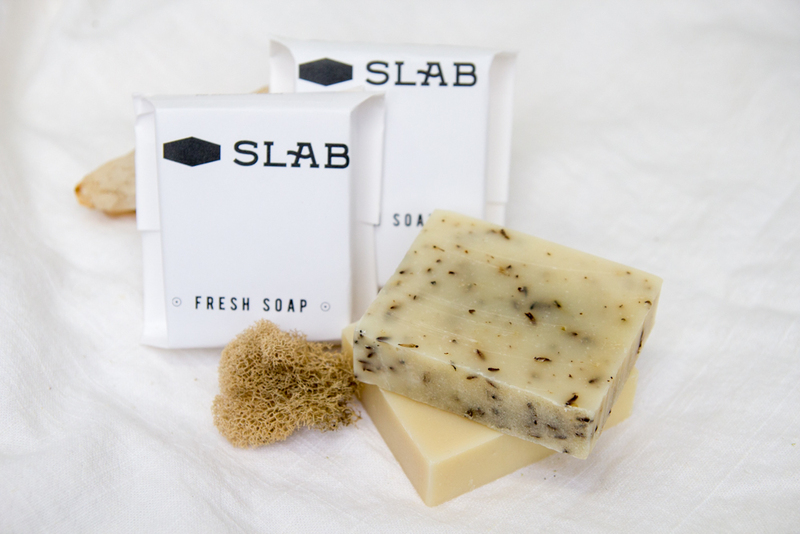 We love SLAB soaps because of their sustainably sourced palm, coconut and olive oil with extra moisturizing exotic butter formula (and great scents!). 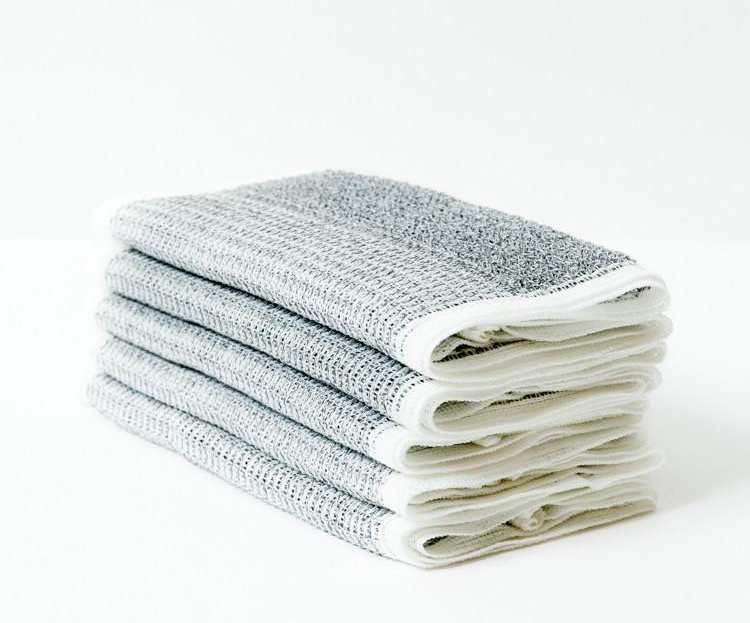 Revitalize your skin with this Morihata scrub towel – it’s fibers are infused with activated Binchotan charcoal. Binchotan charcoal naturally draws out impurities from the skin leaving behind a soft healthy glow. Bonus: this towel can also be used in the shower. 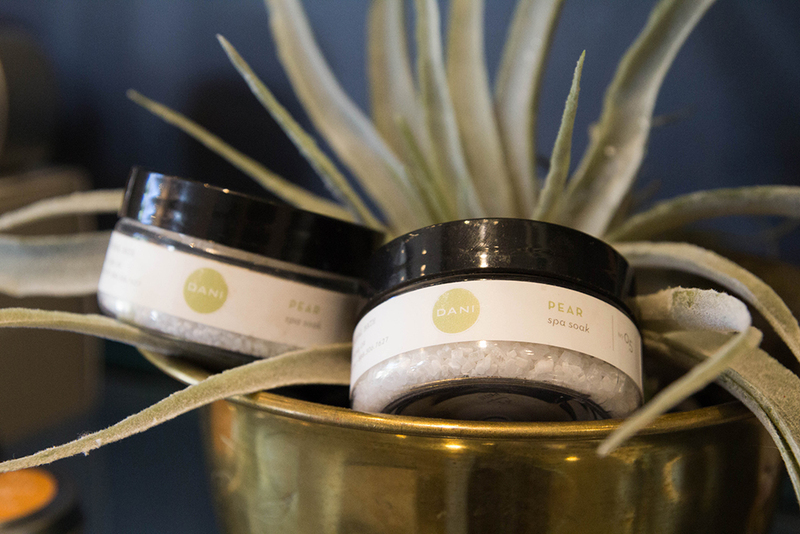 DANI Exfoliating Sugar Scrub gently lifts away dull skin, leaving your skin glowing all over. Organic cane sugar produces alpha hydroxy acids that gently exfoliate and polish skin, while the deep moisturizing blend of organic soybean oil, shea butter, and glycerin soften and protect the new you. Rinse with a natural sea sponge; try to stay away from synthetic sponges as their antimicrobial ingredient of choice is triclosan which has demonstrated adverse health and environmental effects like skin irritation and endocrine disruption. In fact, many popular brands use triclosan! Sea sponges are a gentle exfoliator and a great way to wrap up bath time. Now that you’ve soaked and sloughed away dry skin, it’s important to moisturize! 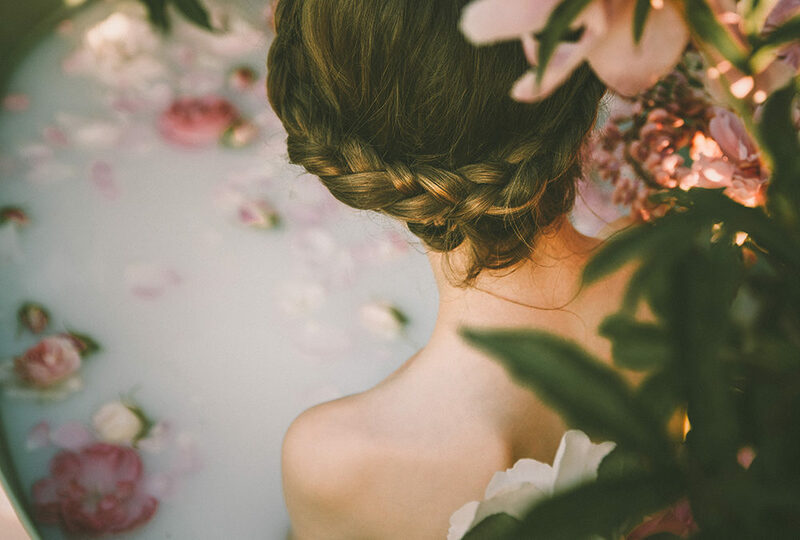 When finished with your bath, do a little self-massage with Eminence Apricot Body Oil from head to toe. 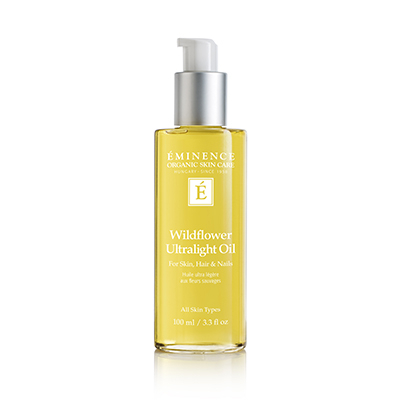 For a lighter touch of moisture, or to use in combination with a body cream, try the new Eminence Wildflower Oil. This organic dry oil absorbs quickly, providing sheer moisture to revitalize the skin’s appearance. Both oils have an amazing scent, as well. Embrace your own special bath ritual and add in treatments or items that make it special for you. For example, Jennifer, Anjou’s Esthetician, loves taking a long mineral salt soak and adds an Eminence Lime Stimulating mask to clean out her pores. Or try a bath bomb in Cleopatra laced with vanilla, cocoa butter, goats milk and honey guaranteed to make you feel like royalty. We’ve got a long winter ahead, so you have plenty of time to perfect your ritual! Reach out to us on social and tell us about your favorite self-care ritual. Anjou Spa is on Facebook and Instagram, sharing our highly curated products, specials, and more self-care tips. Call us at (541) 241-8454 or book online to schedule your next self-care treatment. 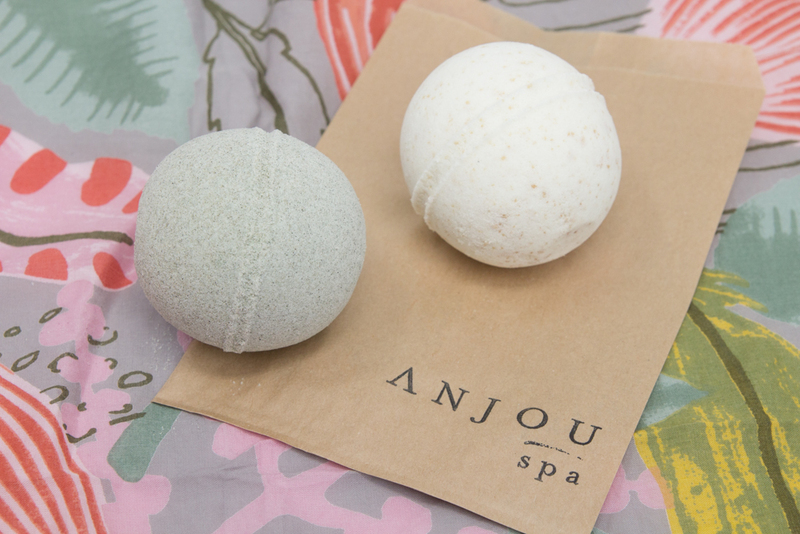 Read more about Anjou Bend Spa Membership and sign up to receive exclusive member specials and samples.